A Lady Reveals Nothing: Meet the New Mr. A Lady Reveals Nothing! 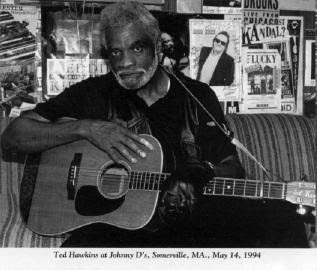 Ted Hawkins. He's gorgeous, he's a musician, and just listen to how he loves his woman. If this song isn't your favorite song in about 30 seconds, there's something seriously wrong with you. "What do you want from the liquor store? Something sour, or something sweet? I'll buy you all that your belly can hold. You can be sure you won't suffer no more." Sorry sweetie this does not do it for me....I don't have time to wait 30 minutes....Judge Judy is on!!! 30 seconds! You never listen to me. And you just don't understand.